Springtime may or may not be here. Dearest Chicago, please make up your mind! But this is why I love this simple transitional outfit from winter into Spring! I'll admit I'm a huge fan of the jegging. (Can I get an amen?) They're the only pants that will ever fit my seemingly unique bottom half. Seriously, how do people find jeans that fit them perfectly? That has never happened to me! But I do love being unique, so I'm going to keep calm and wear my jeggings. I paired my favorite pleather jeggings with a chambray shirt. Simple and easily recreatable with items from your own closet! 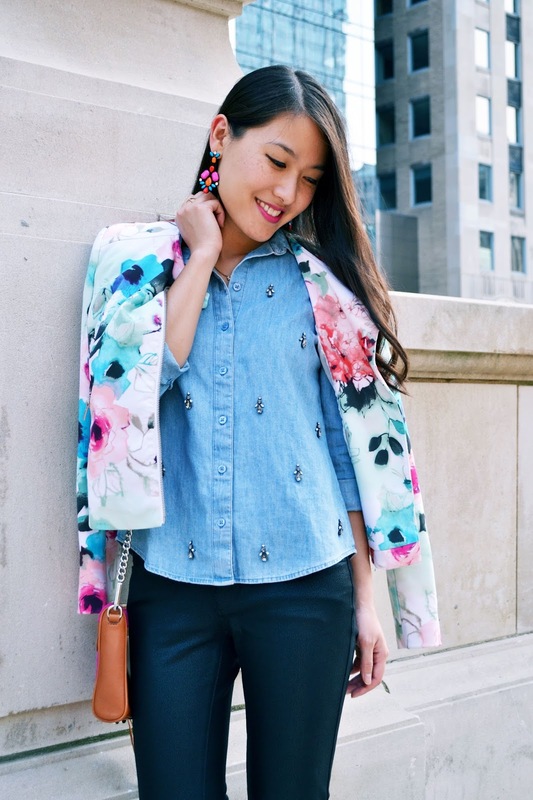 To add some pizzazz to the outfit, I topped the look off with this floral moto jacket! I got the jacket for a steal a couple years ago, and I'm planning to put it to use for years to come. Here's a tip for purchasing statement pieces that will get multiple years of wear: Make sure the item is a classic style such as this moto jacket with a print that's bold but timeless like this floral print. What are your thoughts on investing in statement pieces? While this look is pretty simple, you can take it from casual day wear to a night on the town with your girlfriends. All you need to do is simply add a statement piece like this jacket! You can try a big colorful scarf, bold statement necklace, a brightly colored trench coat, etc. But if you want something similar to this jacket, there are great options below under "Shop My Look"! So funny story, I waited and waited for that jacket to go on sale at Piperlime before it closed. I was soooo close to giving in and then getting it. But I refused to. Then one day it was gone and I legit almost cried about it and now seeing you in it definitely makes me want to cry. What a cute outfit! I love the floral jacket, and the embellishments on that shirt are beautiful! That is a great blazer!! Love your bag, too! Love that floral blazer! The right combo of feminine and edgy style! That is such a beautiful blazer! Love your chambray top too! This is such a cute outfit! :) I have actually never worn jeggings, but they're so cute and they look very comfy! I would totally rock some too!